This was very delicious. The only thing I would cut down on is the white pepper to maybe 1/2 tsp or 1/4 tsp. Also the paste need time to blend with the chicken. Otherwise it was great. I use chicken breast. Some people prefer to grill the thighs because grilling tends to dry meat out a little and they are more juicy. Aw, thanks so much Carol! I hope you enjoy. What kind of bourbon (I’m not a drinker so I don’t know what’s good. Also, can beef bacon be used? I don’t eat pork. We like to use Maker’s Mark bourbon. I have never used beef bacon, but I don’t see why you couldn’t. If you try it, please let me know how it turns out! Do u cook the bacon then add dry ingredients to the bacon fat???? No. 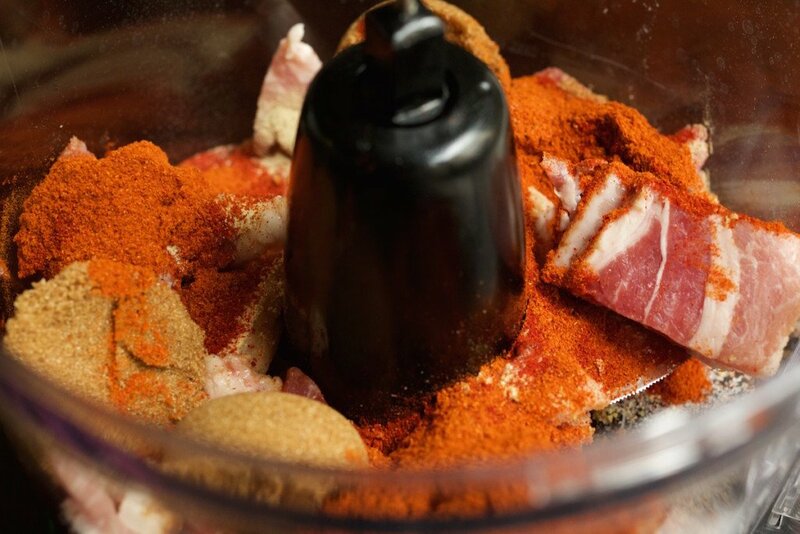 Uncooked bacon goes in the food processor with the dry ingredients. I messed up! Put the whole kitten caboodle in the food processor ? Wish me luck? I’ll let you all know!! My husband was watching and said it looks like a waste of bacon! He doesn’t know I messed up? As a main dish, I would say this serves 4-5 people. Can i use black pepper instead of white? Yes, you can substitute the two. White is milder, so maybe use a little less black. How do you keep the paste on the chicken? Mine just fell off. I’m new at this stuff. Omg I want to make this but don’t have a food processor, can I use a blender on pulse? You could try…I think you might need a very sharp blender like a Vitamix to turn the bacon into paste. If you try it, let me know how it goes. Any tips on getting the paste to stay on the chicken? Is it sticking to your hands or just not staying on the chicken? Oil your hands to prevent it from sticking to them. I had to sort of press and mold the paste around the chicken to get it to stick. Just made this for dinner. It was thumbs up from the family! The bacon paste was hard to get to stick but I actually put it on once the chicken was on the screwers already. It stick pretty good. Just had to be careful when flipping it. It was so juicy and moist! I didn’t think the bourbon made much of a difference in the BBQ sauce but my husband thought it must have. He said he’s not a big BBQ guy but he liked this! I used a little more than it called for. Can i marinate the chicken in the spices, and thread the bacon with the chicken on skewers? I’ve never tried it, but I think it could work. Let me know how it turns out! I’ve tried marinating the chicken and threading the bacon with the chicken on the skewers, it came out perfectly. This recipe will be in the my regular dinner rotation. Very easy to make and great flavor. 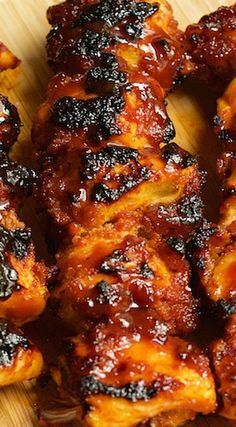 Bacon and bourbon are such perfect flavors to incorporate into BBQ sauce! What a great chicken dinner for the grill! I am vegetarian but my family would love to try this recipe, the love BBQ cooking even in the winter. It looks yummy. Sounds like sticky goodness. Wonderful flavors of bacon, BBQ, and Bourbon! Good Lord, we’re gonna try this one! 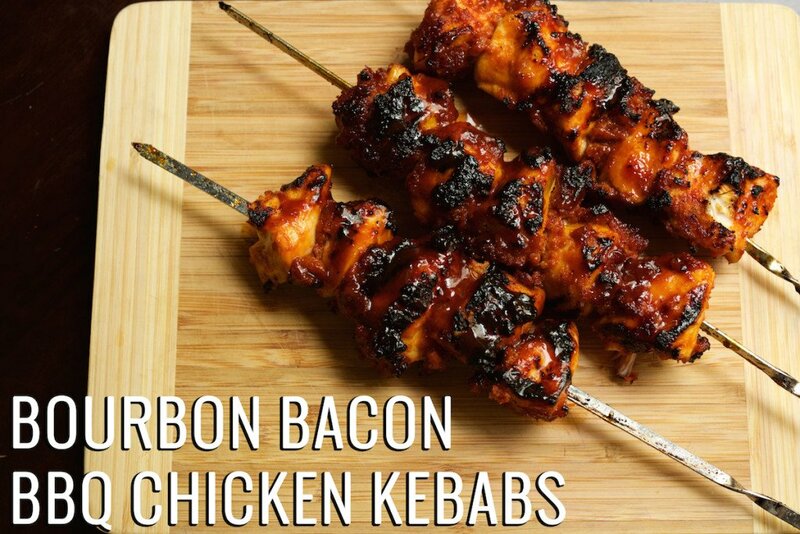 Ah this sounds so interesting – I have never added bacon to my kebabs before. What a genius idea! Bet these was so moist and tender. yum. I wish your bourbon bacon kebabs where my dinner today!! Just look at these, I am soooo hungry right now, I wish I could have this with a drink right away. What a tease! I never think to make kebabs, but these looks so good I’m going to have to – ASAP! Mmm! I just love kebabs. So delicious! I love kebab and these are so yumm! These look SO delicious! Love the addition of bourbon and bacon to just about anything, but they look especially good here! Wow! These look amazing. I love Sweet Baby Rays too. It sounds like a robust spice mixture, pinning this for later. Was a crowd pleaser. 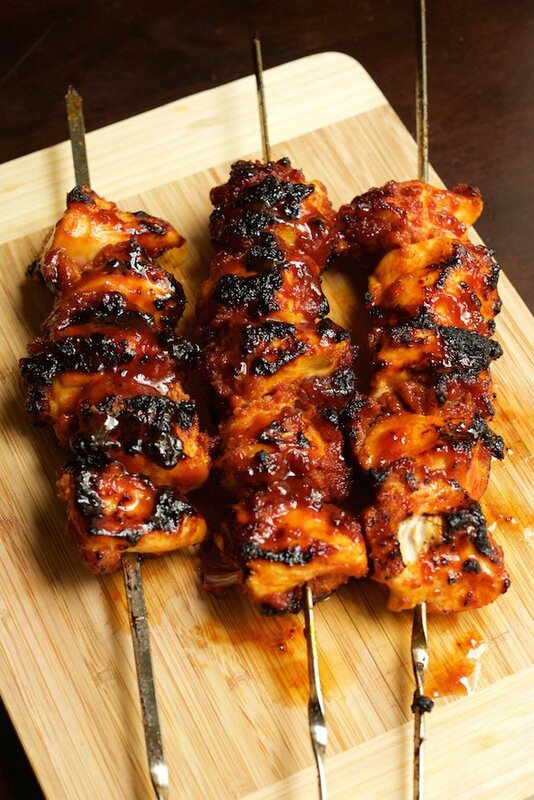 I found that if you put the chicken on the skewers and then patted them dry with paper towel, the paste stuck better. I love the spice mix you used for this recipe! I bet it was delicious! OMGosh! I just had the thought to use the bacon paste for making meatballs! Or to cook the meatballs in! Thanks for the inspiration! Yes you can put it in the oven 375 about 30 min depending on your oven, than broiler to char. However chicken temps should be 165+. and I thread the bacon on the the skewer in instead of making the rub. I use all the other ingredients and marinate the chicken rather than putting on a paste. This came out very well. Let me know how yours came out? Excellent recipe. I think the problems related to getting the paste to stick are related to the thickness of Sweet Baby Ray’s sauce. I used a heavy molasses based sauce, KC Masterpiece Original. No problem. I recently made this recipe and must admit that it was really good. There was left over bacon paste which I cooked (made bacon bits)and used for an apple and blue cheese salad to go with chicken. I some trouble getting the paste to adhere to the chicken. I warmed it slightly in the microwave and that did the trick.